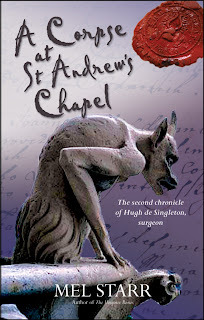 A Corpse at St. Andrew's Chapel is the second book in Mel Starr's mystery series around Hugh de Singleton, a surgeon and bailiff in 14th century England. A body is found outside an old church in his jurisdiction, seemingly savaged by wolves. But there have been no wolf sightings in the area and there is very little blood, which leads Hugh to believe no animal was involved. The dead man's shoes were stolen, too- no wolf would do that. Hugh realizes things go even further than he originally suspects when, the more he digs, the more he seems to be a target for violence. Soon, one of his suspects is found dead of an arrow to the back, and Hugh must hurry to solve the case before he is yet another victim of the plot. I received this book through the LibraryThing Early Reviewers program. I have not read the first book in the series, but that did not seem to factor into my understanding of the second at all. The first book is alluded to, but I had no trouble following this story without having read that one. If I had known previously that this book was Christian fiction, I never would have requested it from the program. It is not marketed as such, but I would call it a medieval Christian mystery. I really wish that publishers and authors would be more upfront about whether or not they are publishing faith-based fiction. It is very frustrating to get a book you think is a straight mystery and then get religious teachings in there, too. This book is not overt about it- I would say it's fairly understated, but the religious undertones were present and I wish I had known that. To me, not mentioning that a book is Christian fiction is kind of like subtly trying to convert someone to the faith. I know that is a huge overreaction, but that's still how it feels to me. As to the story itself. Do you ever finish a book, set it down and think, "Meh"? That is how this book was for me. Hugh de Singleton is a nice guy, and he has a very quiet, self-deprecating sense of humor. I liked him, but I didn't feel attached to him. He seemed to spend a lot of the book getting hit in the head with a cudgel (ouch! You'd think you'd learn after the first time! ), eating (the food descriptions in this book are fantastic, if that's something you like in literature- I do! ), and waiting around in the dark for suspects to walk past him (they never do). This is interesting in a way because Hugh is new at investigating things. Most mysteries seem to revolve around people who know very well how to go about discovering facts and tracking suspects. Hugh does not, and it's refreshing to see him make mistakes or follow dead ends. But I don't know how he had got hit in the head so many times and still did not learn to be more careful. And Hugh doesn't really even solve the mystery. He really just kind of stumbles over a suspect, catches him, and then has him confess. Hugh himself didn't have the full idea- and you can't blame him because for one of the culprits, no clues were given at all about his involvement. So for me, the mystery fell pretty flat. Again, this may be because Hugh is a new investigator (and the author is a new author), but this disappointed me. I also thought the book ended really abruptly. I suppose this is meant to be a way to segue to the next book in the series, but the last sentence, "They've stolen my books" was not the way I expected the book to end. What was interesting- besides the great descriptions of food!- were the medical procedures and beliefs presented in the book. Hugh trained himself to be a surgeon and so we get to see him at work a few times in the book, using only medieval instruments. He also only has access to medieval knowledge. For example, one of his patients had a tree fall on the right side of his head (seriously, in this book, it seems as though everyone gets multiple head injuries) and thus experiences weakness in his left arm and leg. But Hugh has no explanation for him on why this would be so as at this time, no one knew that the right side of the brain controls the left side of the body. I received this book for free to review. What, it wants to convert people to Catholicism? Or just nonspecific, nondenominationl Christianity? I find that most medieval mysteries set in Europe tend to have a Christian setting due to its all-pervading influence in that period. I saw the first in this series in the bookshop several months ago and thought it looked interesting (although I didn't get it). It's a shame you didn't like it, although the food descriptions sound interesting. I'm sorry you didn't like it. I have this on my wish list though, and I didn't know it was Christian Fiction. But that won't stop me from reading it. It seems like we tend to read the same books lately. I have just finished High Rising and will review it soon. I really liked it. Thanks for bringing it to my attention. Your review is an excellent example of why I think bloggers who write about books are in the forefront now. This was worthy of publication. Just excellent. You told what the book was about, you noted interesting details, and expressed very well your criticisms of the book. No one could ask for more. Great post! That's too bad it didn't live up to expectations. :/ I've read 2 Christian fiction books this year (for Amy's challenge), and they've both been subpar. Jenny- I am afraid I wouldn't really be able to tell the difference. At the time the book is set, there is no Catholicism as there was no break within the church yet. chasingbawa- I haven't read many medieval mysteries, but I have read many stories set in Europe at the time and I don't think the religion thing comes up nearly so much in other fiction. Andreea- Ooh, I can't wait to read your review of High Rising. I looked for Thirkell in a used bookstore yesterday, but nothing. Eva- Oh, that is unfortunate. I feel sometimes with religious fiction, the religion takes over the fiction. From the cover I would never guess that this was Christian fiction. Teaching about faith should never be sneaky,although sometimes faith is so much a part of peoples' lives, maybe they don't even realize it's coming out in their writing. For some reason I've always veered away from Christian fiction, even though I'm Christian. I don't get the idea that I'm missing out. As already mentioned, the role of Christianity during anything with a medieval setting probably can't be ignored. But I agree with you that if there is going to be proselytizing, I would want to know ahead of time (and likely would therefore ignore it). I can totally see your point about wanting to know up front that it is Christian Fiction. At the same time, though, authors are often trying to convince us of something, even in fiction, whether it be their political views, their opinion on gender roles or humans impact on the environment, for example. We don't expect them to announce what their angle is beforehand. Of course, the fact that it was lousy as a mystery doesn't help. I don't like Christian fiction at all. I do think it is wrong that they didn't let you know in the blurb. I would be really annoyed. Shelley- I'm sure some people don't realize it, but shouldn't editors and publishers know? I think a lot of people veer away from religious reading, even if they follow the religion. Valerie- Yes, I understand that it had a role, but I still think it's possible not to have that role be so prominent. I just reviewed The Scarlet Lion and that was not religious seeming at all. Vivienne- I am with you there, obviously! Just reading the summary gave me chills. What a vivid image--thanks for sharing this book! Thanks for this review -- I had been on the fence about reading it, but I appreciate the note about it being Christian fiction. Blech. Christian fiction is very hot, it seems -- more and more is showing up in ARC giveaways, etc. I think I'll pass on this one. I like clever mysteries, not ones where the main character just happens to come across the culprit. Thanks for the review, though. I read Christian fiction, but when I do, I want to know right off the bat if that is what I am in for. I don't like it when I feel tricked by catching it in the middle of a story. This has happened to my husband a few times with some of the science fiction he reads. He was totally not expecting it to be a Christian book, and then all of a sudden, there it is! I do like the fact that this book has such great food descriptions (I am a sucker for good food writing) but I don't think I would be very interested in reading about a muddling detective who doesn't have a clue as to what he's doing. The mystery aspect of the book doesn't sound all that enticing either, so I think I will probably skip this one. Thank you for being so honest about it though, I really appreciate that! I feel the same way about religious fiction. I do sometimes find it interesting to read novels that deal with different faiths, but I like to know what I'm getting upfront. Otherwise, it seems like the publisher's trying to trick me into accepting a particular religious stance. Pfft. I hate being "gently taught" when I just want to read a good book. Hugh sounds a bit dopish too.